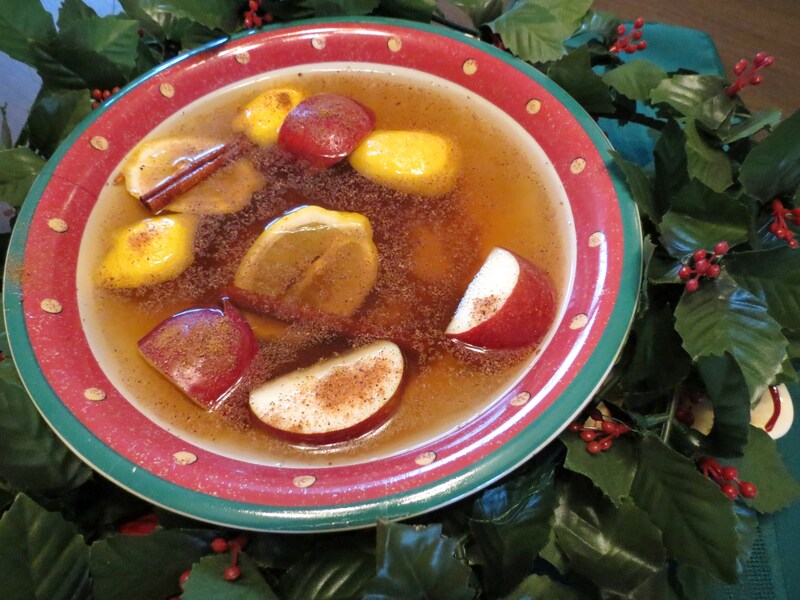 Christmas/Winter Simmering Spice Mix – Makes Your Home Smell Wonderful ! I truly wish I could include a ‘scratch ‘n sniff’ icon for this post – my house smells wonderful right now ’cause I’m simmering a mixture of spices and fruit, all of which I usually have around the house. ++ After and hour or so you may want to sprinkle in a bit more of the spices and rum flavoring. As you may know, we used to move A LOT, and because each house has it’s own smell, as soon as we’d moved in, I’d start a pan ‘brewing’ with this mix. Within a very short time the house smelled like home …our home! In fact, you’ll have people who visit asking if you’ve been baking cookies. This year I’ve add the following – simply because I had them…. — A bit of Rum Flavoring, for that good old Yuletide ‘Nog Essence! That’s it ! I know the lovely smell of this mixture will make your heart happy – no matter when you use it! Plus the simmering water adds some much-needed moisture to your home, which is nice during these cold, wintry months. Enjoy!! Delicious, I can already smell the holidays here! What a great idea! I would love to have this simmering in my house. 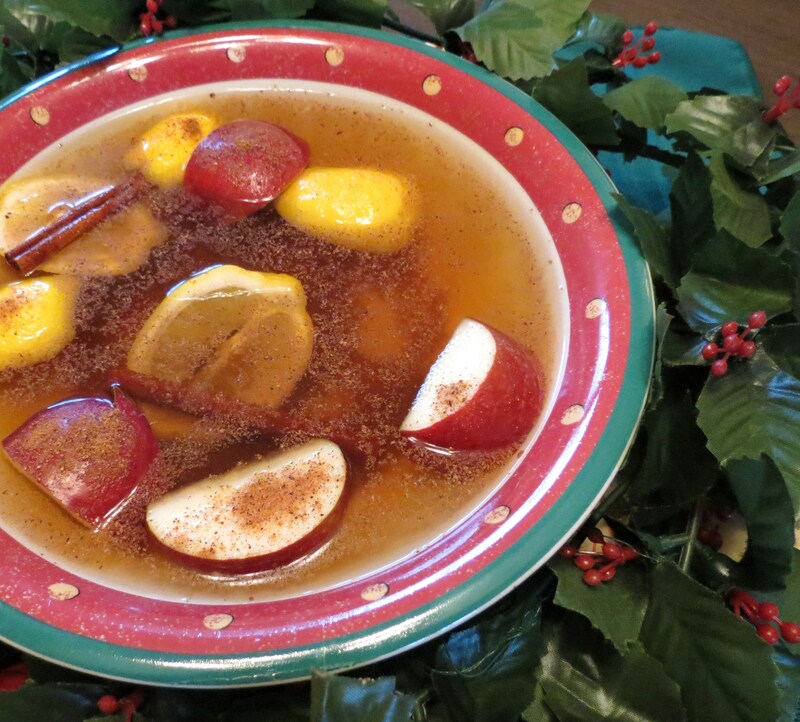 I love apple and spice mix smell! When my twin sons & their families (and my own twin brother) arrived for our ‘Roy Christmas’ on Saturday the house smelled so nice. The lovely smell of spices and fruit blended well with the delicious odor of baking French Canadian Meat Pies! This is such a great idea, Cecill, and so much healthier than those canned fragrances. I can’t use any of them, nor most commercial scents because most are harmful to my parrot. This, though, I could use without any worry. Thanks for the idea. Thanks Karen – I love that idea!! I like to do this whenever I have anyone over for the holidays. The whole house smells yummy. You are so right my friend!! Do you have any suggestions for me – meaning spices/fruit you add in that I haven’t thought of. It’s always fun to ‘mix it up’ ! I like to put whole cloves into an orange and add it to the liquid. Thanks – I went out do to some errands…. Chinese take-out, egg nog & rum – plus some Christmas gift buying. When I returned, my house smelled sooo good. I know my boys and their families are going to like it when they arrive this coming Saturday – when we do what we call our Roy Christmas!!!! The house will smell like French Canadian Meat Pies and this spice mixture! !